faster, easier and cheaper than recording real voices. From developer's script to synchronized speech in seconds! ♦ Save 50% time and 2/3 the cost of professional voice recording - while keeping professional voice quality. ♦ Save 75% time in updating courses. ♦ Synchronizes voice with animations without time-line editing. ♦ Immediate generation of captions (subtitles) and PowerPoint notes. ♦ Works with major e-learning authoring tools. ♦ Produce narrated videos with PowerPoint or with other existing tools. ♦ Voices licensed for commercial use. ♦ Learn it fast - plug-in to well-known PowerPoint. ♦ Generate narration clips from developer's script with text to speech. ♦ Revise and update narration clips by editing the script text. ♦ Attach narration clips to animated screen text or graphics or play them in the background. ♦ Combine multiple audio sources. ♦ Clip Editor: Copy, cut and paste narration clips between screen objects and re-order clips. ♦ SAPI Text Editor: Modulate and enhance voices by adding special characters in the script text. ♦ Pronunciation Editor: Handles difficult words. "Short technical/repair training modules that took us a month or more to develop and schedule voice-over, now literally take us just days to develop start to finish, right on the desktop." Mark Hoefle, Lead Courseware Developer, Check Point Software Technologies. "The tool is so easy to use and has features that allow you to be as creative as you want." "An easy, smart and effective plugin for PowerPoint." Speech-Over automatically syncs the narration with PowerPoint animations of text and graphics or, for static slides, plays it in the background. Learn more. Like a live presenter, Speech-Over doesn't just read the text on the screen. It adds explanations to text bullets and graphics according to the developer's script. Since Speech-Over is an add-in to PowerPoint®, the narration is compatible with the e-Learning authoring tools iSpring®, Camtasia®, Articulate®, and Captivate® through their PowerPoint interface! Learn more. 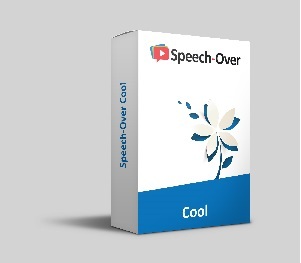 As opposed to voice recording, Speech-Over allows you to generate the narration whenever and as often as you like. This means you can write the script, preview the narration immediately, and revise the script at all stages of development to produce very effective narration content. Optionally, Speech-Over generates captions/subtitles and speaker notes. Speech-Over is a complete narration solution. You can combine three different audio sources on a single slide: microphone recording, audio files and text-to-speech voices. Excellent for e-learning, training, marketing, and education for businesses, corporations, institutions, and government agencies. Includes the commercial TTS voice license you need. Learn more. Recently added: Animated Storytelling With Connected Motion Paths and Speech-Over. Learn more. Training managers and course developers in companies like CheckPoint, Motorola, Otis Elevator, and VEGA Grieshaber KG, trust and rely on Speech-Over. Watch the video and hear what they have to say. Here is an example of an e-learning video produced with PowerPoint and Speech-Over. Note how the narration is synced with the visuals. Here is an example of a continuous narrated animation created with connected motion paths and Speech-Over. Learn more. The narrator's voice captures the learner's attention, sets a pace and motivates learning. With only on-screen text, it is difficult to read the text and view the graphics at the same time. The narration delivers much more content. A two minute slide can have 300 spoken words but not more than 50 words of readable text. The narrator uses phrasing and articulation in their speech to bring out the exact meaning of the material in a way that text cannot do. Rapid and cost effective narration software for producing audio presentations and videos for business, education and training in institutions, corporations and government. Includes two Acapela-Group premium text to speech (TTS) voices with commercial license. One time price: Now $299. Requirements: Microsoft Office® 2010, 2013, 2016. Win 7, Win 8, Win 10. Includes Acapela premium TTS US English voices Tracy and Rod (32-bit) and Sharon and Rod (64-bit). Speech Over Professional (32-bit) now includes three additional Acapela TTS voices: Sharon, Ryan and Graham at no extra cost - a savings of $300. Includes Acapela premium TTS German voices Julia and Klaus. Includes Acapela premium TTS Danish voices Mette and Rasmus. Includes Acapela premium TTS Indian English voices Deepa and Graham. Low cost professional narration software for producing audio presentations and videos for home, family, school and community. Includes Heather and Ryan, premium quality TTS voices from Acapela Group with a personal license for using the voice. Only $99. Low-cost voice-over software for those new to text-to-speech narration in presentations. Great for producing audio presentations and videos for any application. Has all the features of the professional version. Includes cool MS Speech Platform TTS voices with unrestricted license. $99. 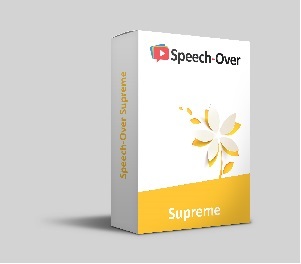 Speech-Over Supreme US English – for Unrestricted Professional Applications. Rapid and cost effective narration software for producing audio presentations and videos for sale. Includes Acapela premium TTS voices Rod and Tracy with unlimited redistribution license. $220/month.